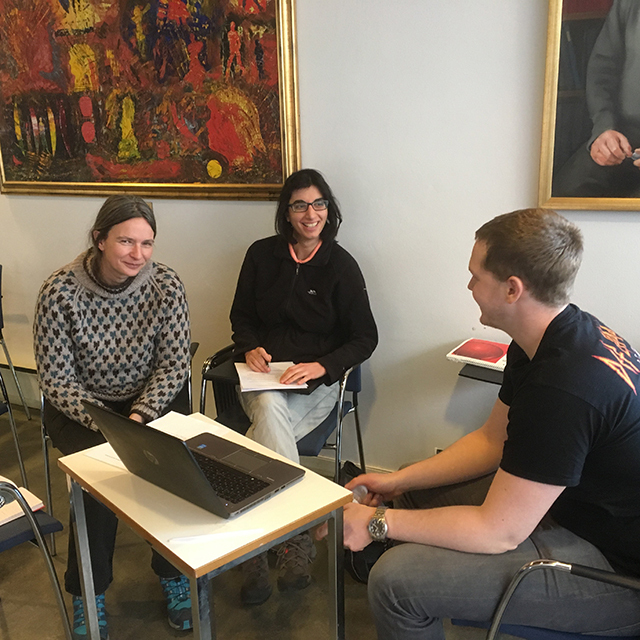 In the beginning of March 2017, I attended the one-week course “Epidemiological methods, beyond the basics” at University of Oslo. The course is recommended by EPINOR. It was an informative and challenging experience with engaging and experienced lecturers within different topics. Participants were mainly PhD students, working with different topics and with different methods. Both with clinical studies, register studies and already collected data as for example The Tromsø Study, The Hordaland Health Study (HUSK) and The Nord-Trøndelag Health Study (The HUNT Study). From left: Anne Sofie Larsen, Josefine Argyrou, Vegard Lysne. The picture is from one of several group discussions. The course has five main subjects: Causal thinking, Causal graphs (DAGs), Modern designs, Multilevel models and Multiple imputation. Lectures in every main topic lasted for approximately one day. Some minor topics were also lectured in, as interaction, sensitivity analysis and an introduction to the statistical program STATA. Normally, register epidemiology is also included. Lectures were interactive and the threshold for asking questions was low. Each day was built up with both lectures and group assignments. Questions discussed in groups were also discussed in plenary, with great interest from both lecturer and students. Causal thinking and DAGs were useful to learn since when understanding the use of causal graphs, it helps you to understand which variables that should be adjusted for, and which variables that should not be adjusted for. I find DAGs to both simplify and complicate the understanding of associations between different variables and outcomes. It gives a different angle that balances the angle you get from statistical methods. The design part underwent different research designs as cross sectional, cohort and case control, while the attention was mainly on advanced designs as nested case control, case cohort and cross designs. Strengths and weaknesses of the different designs were discussed with examples. These are study designs that are less mentioned in the literature and in basic epidemiological courses, therefore it was useful to discuss them in plenary and to have examples to learn from. When learning about Multilevel models, studies that results in hierarchical data and problems this give when doing the analysis were undergone. However, focus was mostly on how to solve these problems. The Multiple imputation part gave an introduction to different missing-data mechanisms and how to handle missing data. Focus was on theoretical methods used in order to make imputation for missing data, but the lecture also included a practical part using STATA. Unless you have not worked with the method before, it will probably be necessary with more reading before you feel confident with it, but it was a nice introduction to an advanced topic. Summing up my experiences from the course, it is a course that addresses different topics within epidemiology. Some of them I have already heard about in earlier basic epidemiology courses, and this course gave useful repetition. Other topics were new to me, and I got a taster, enough to give an impression of whether it is something I want to go deeper into by reading on my own or by taking additional courses. The course lasted from 9.00 am to 4.00 pm with plenty of time for lunch and small breaks. Lunch breaks and group works gave time to talk to people attending the course that came from all over the country. I stayed at the relatively low-priced, Anker Hotel. It was easy to travel by tram from the hotel to Ullevål hospital, where the course was held. It is a course I would recommend if you work with epidemiology and want to learn more than just exactly what your project is about.